Thursday, September 12 was a big day for children in Bavaria: the first day of school. In our family, it was especially important because my son had his first day of 1st grade. Now, I'm sure you're thinking that happens to millions of children all over the world. But, in Germany, the first day is a very special day. It's a milestone in their lives. First graders are no longer "little kids." They are Schulkinder—School Kids—older and more responsible than ever before. Darth Maul shows off my son's Schultüte. When my now 8-year-old daughter first started school, I was horrified at the preparation surrounding the day. 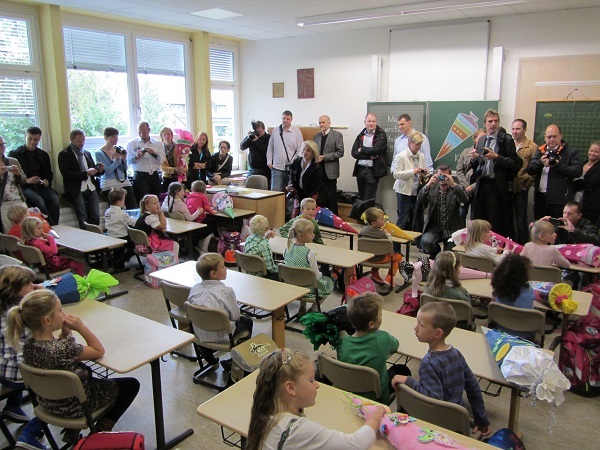 You had to find the perfect backpack and build a fancy Schultüte (school-cone, see picture). Then you had to figure out what sort of goodies to buy to stuff it, in addition to all the other school supplies. 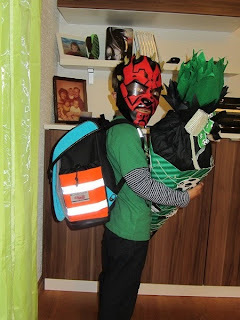 Darth Maul showing off the new backpack. In the years since then, I've come not only to accept the weight given this day, but to see the value in it. Kids understand the first day of school as a real change, a positive change in their lives. In our family, my husband and I both took the day off to accompany our kids to school, and their grandparents and godparents did also, until a party of six adults made their way to school that morning. 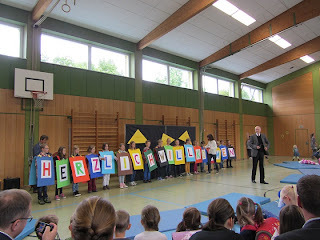 The day started with a non-denominational church service in the public school's gym (yes, they do that in Germany). Then the children were separated into their classes. This is the most stressful time. Until then, they don't know which teacher they'll have. They don't know if their friends will be in the same class or not. 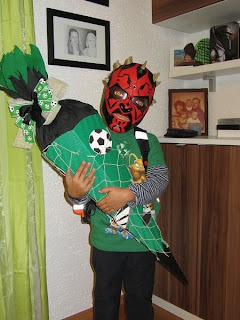 Luckily, my son got the teacher he wanted and one of his good friends. Whew! Next the teacher headed to the classroom with the new 1st Graders following. After them came all the parents and grandparents, packed around the edges of the classroom. Most adults stood behind the camera. The teacher greeted the kids, encouraged pictures, and then pulled out a puppet, who had an embarrassing story to tell about his own first day. The children wanted to hear the story, but the puppet would only agree to tell the kids. We adults filed out and drank coffee while the kids had their first few moments alone in school. Less than a half-hour later, the new 1st Graders stormed out, and we headed to a local restaurant for lunch. The restaurant got in on the celebration by giving every child who ate there that day a mini-Schultüte filled with candy and yoyos. We rounded out the day with coffee and cake at home. And everyone who talked to my son that day congratulated him on being such a big boy—a Schulkind. So what do you think? Is it a crazy, over-the-top way of dealing with school? Or wonderful rite-of-passage? Having them in school really does change everything. Good luck and remember to have fun (says the mother of 8th and 7th graders)! Porcupines and Snakes and Bears, Oh My!